It all came together with a picture of a kid leaping through a sprinkler, his fist pumped in the air. The joy and determination on his face was obvious. He intuitively knew the path forward. We could see ourselves in this kid and we wanted to capture that spirit and bring it to our clients. It felt weird hiring a company to do research on us, a research company. But, like we tell our clients, third party impartiality is a necessity in the branding process. Several of our clients and prospective clients were interviewed on our industry, on Lux and on our other research friends. We heard loud and clear that most of you feel like you are are having to do more with less and you are not always getting useful ‘ah-has.’ Some of you feel like you’re driving while looking in the rear view mirror. We heard that you’re not just looking for the ‘insights’, you’re also looking for the ‘foresights.’ You want a clear path forward. From the research, it was clear that our job is to take the pain away and provide useful insights (the real ah-has) and direction. The research led to a facilitated full-day brainstorm session. As facilitators ourselves, it was eye-opening to be the participants this time. We went through a full SWOT analysis and then hashed out our inspiration brands: Pixar, IDEO and Tesla. Next it was time to use images to try and pull our thoughts together. We were asked to choose pictures that best represented what we thought our brand could be. 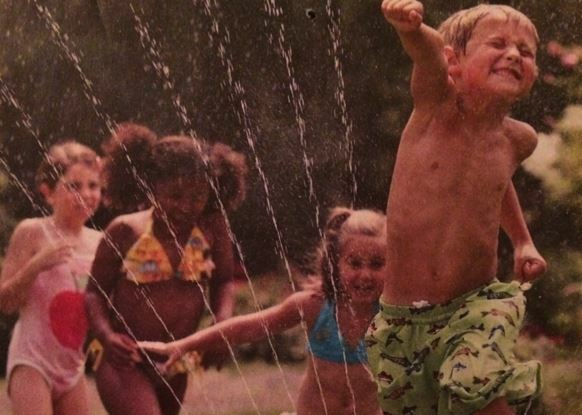 Enter the kid leaping through the sprinkler. The photo immediately galvanized the group. He was fresh, confident and inspired. These later became key descriptors in our brand blueprint. With that, it felt like the right way to end the day. Plus we were friggin’ exhausted. Our brains literally hurt. A month later we had our brand blueprint in hand which has since underpinned our relationships with our clients, our company culture, our deliverables, our hires, our internal systems and processes and of course our website.